This little park in the Mill Village neighborhood is a perfect example of a pocket park. It has a little field, a playground, a monument and a place to congregate. It is not separated from everything else (i.e. houses) like our other larger parks. In fact is is surrounded by houses on all sides (excluding a couple of empty lots). Houses around it don't need big yards because the park is there. 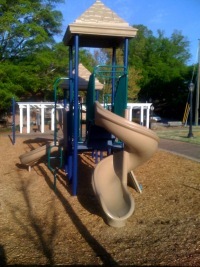 It is private but accessible in a way that most other Roswell parks are not. Roswell needs more parks like this one in the middle of its neighborhoods. I'd like to see an annual neighborhood gathering in the park to engage the residents of the neighborhood even more. Anyone want to help us organize one?